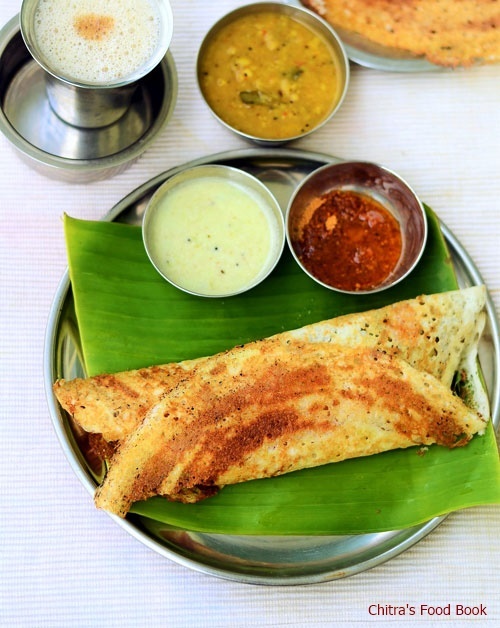 Masala dosa –Needless to say its one of the most popular South Indian Special dosa varieties. My daughter Raksha is a big fan of this dosa. Recently when we went to a restaurant for breakfast,I saw a foreigner ordering Masala dosa and Filter coffee. I felt so happy & proud that the taste of our masala dosa has reached people all over the world. 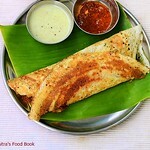 I also realized that I did not post this most wanted dosa recipe in my blog yet. 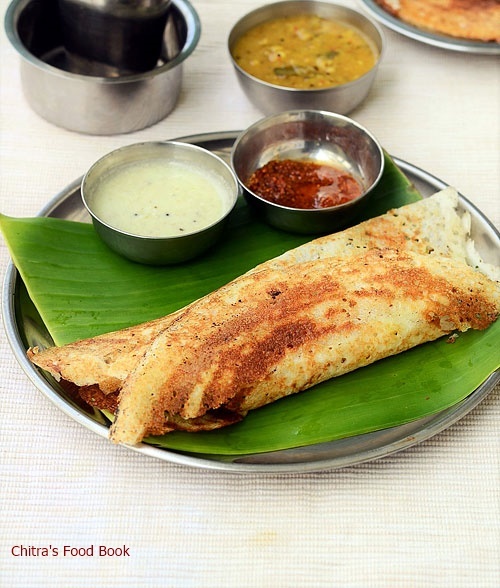 Masala dosa is very popular in Karnataka & Tamil nadu hotels. 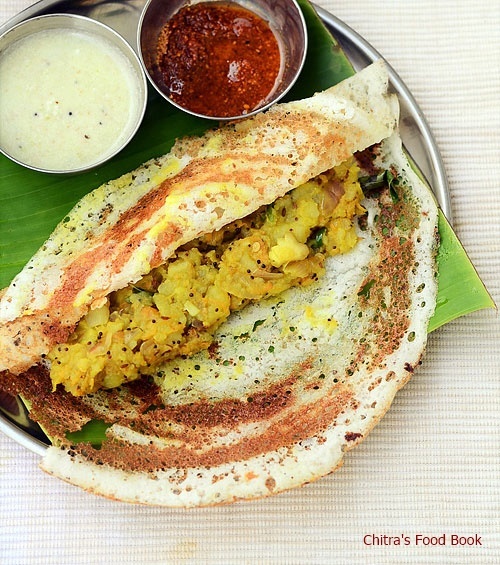 In Karnataka, a special dosa batter is made using rice, dals and poha. Check out my Karnataka masala dosa recipe with red chutney and potato palya. Today I have shared Tamil nadu style potato masala dosa using the regular idli,dosa batter. I have shared the urulaikizhangu masala recipe based on the ones I have tasted in hotels. I hope u will like this recipe & give a try. Ok, lets see how to make South Indian masal dosa /Tamil nadu restaurant style masala dosa at home. Do check out my potato masala for poori ! South Indian masala dosa using idli dosa batter - An yummy breakfast recipe ! Wash and pressure cook potatoes. Peel the skin and mash it well. Heat oil in a kadai.Splutter mustard,urad dal and chana dal.Saute till dals turn golden brown.Add the finely chopped onions,grated carrot,green chilli and ginger.Add curry leaves.Saute everything well. Lastly add the mashed potato,salt,turmeric powder and hing.Mix them well and add very little water say 3-4 tbsp.Mix well and let it become a whole mass.Garnish with coriander leaves and remove. Take the required idli batter in a bowl. Add little water and make it slightly thin if the batter is too thick.Heat a dosa pan and spread a ladleful of batter.Cook in high flame for few seconds.You will see the bottom of dosa turning golden brown.At that time,drizzle a tsp of oil all over the dosa and keep some potato filling in the middle of dosa.No need to flip the dosa.Just fold the dosa and serve hot with chutney & sambar. Adding grated carrot is optional.In some hotels ,they add boiled peas along with potato instead of carrot. You can drizzle some ghee instead of cooking oil all over the dosa. You can fold the dosa like a triangle to attract your kids. 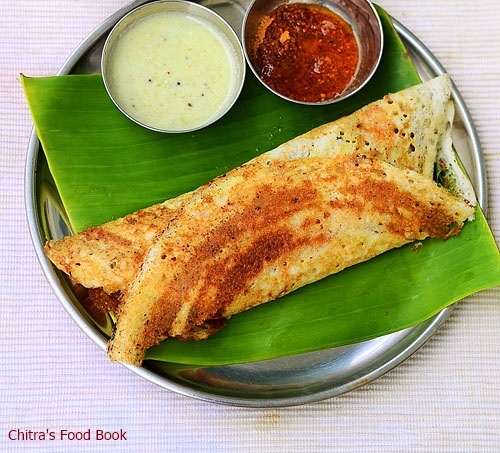 Enjoy this South Indian Masala dosa with chutney,sambar along with filter coffee ! Have a filling breakfast ! perfect Chitra..good start for the day! My all time fav.looks delicious.. Most loved south Indian breakfast is masala dosa you made more delicious .Thanks for sharing.To get more offers on online food orders checkout Foodpanda offers at Grabon India. That looks fantastic! thanks for sharing the recipe. Yeah I love south Indian foods - Idli, dosa. When you will post another south Indian food post.